Miss Brewton responds to Martha Berry's query that 82 of the male students are of draft age. She confirms Berry's instructions that no one else be allowed to use the typewriter in her office. 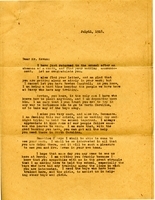 Colonel Hugh S. Johnson addresses a letter from Martha Berry that had been passed from the Secretary of the Treasury William G. McAdoo to the Secretary of War. 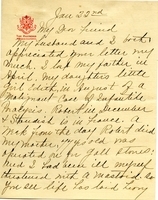 Berry hoped to get a draft deferment for one of her teachers, S.H. Cook, but as Colonel Johnson replied, there is no way to give Mr. Cook an exemption. McAddo responds to Martha Berry's request for one of her teachers receive a draft exemption. 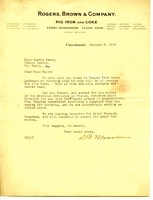 Unfortunately, it cannot be done, as McAdoo has addressed the problem with the Secretary of War. 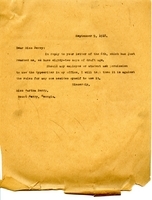 Berry writes to Mr. Cook to ask if he may get a furlough in order to return to the Berry School, because of a shortage of teachers. Berry says that both she and the boys at the school miss Mr. Cook very much. Mrs. Meacham experienced much loss in the past year. She is sending twenty-five dollars to the Berry School and will think about establishing a scholarship in honor of her son who recently passed away. 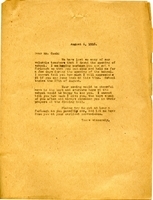 The Secretary of the Treasury, William G. McAdoo, responds to Berry's letter by referring the matter of her teacher, S.H. Cook, being drafted to the Secretary of War. Meacham is donating used clothing to the Berry School for the boys to wear. His son, Robert, served in the War but died from appendicitis after he returned home--the clothing was his. Meacham's wife remembered a previously sent request for clothing, so they are sending Robert's clothing.